We are happy to publish a renewed version of the Demo project for you all to familiarize yourself with Testlab. You can find the project by logging to your Testlab and choosing project “Demo”. The new Demo project tells a story of Boris Buyer who has an online book store. He’s selling some books in his web store but has been lately noticing declining sales. He decides to develop his web store further by the aid of his brother in law who owns an IT-company specializing in web design. They hatch up a plan to develop Boris’ online business further with few agile development milestones. The data in “Demo” project has all the requirements, user stories, test cases, test sets, test runs, testing results and issues to make it easier for you to grasp on the concepts of Testlab. The project starts at January 1st of 2013, has one milestone version completed and happily installed in production, second milestone completed but still in testing and a third milestone for which the planning has been just started. 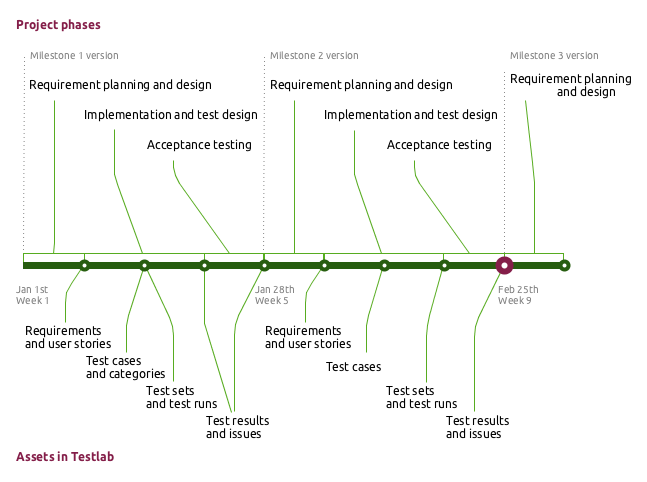 The timeline diagram above presents a rough sketch of “Demo” project’s progress showing the phases of the project at the top and the relevant assets found in Testlab at the bottom. Purple highlight on the timeline presents the moment in time the project is currently in. Great, where can I read more ? All new registrants will get this link in their welcome message you get when you sign up. Just to note – all existing customers and registrants have their old Demo project renamed as “Old demo” so any changes you’ve made to your previous demo project aren’t lost.